Vacationers looking for Guanacaste hotels within walking distance of the beach can set their sights on the Jardín del Eden inTamarindo. This enchanting beach hotel is situated on a small hill and is a mere 120 meters from the beach. From within, guests can enjoy a magnificent view of Tamarindo Bay and watch the sun set over the Pacific Ocean. The Liberia airport is 30 miles from Jardín del Eden and Tamarindo airport is only 2 miles away if you prefer to fly in instead of driving. 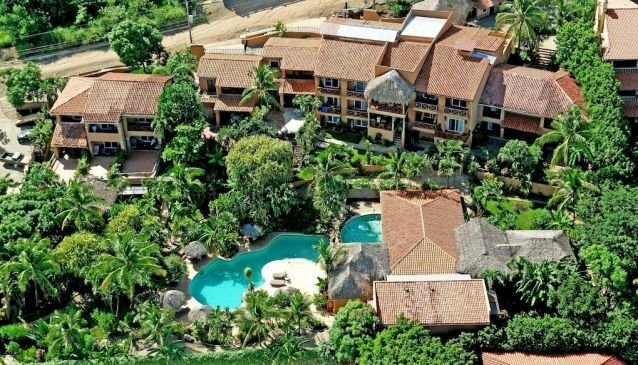 The Jardín del Eden consists of five villas with independent rooms. Each room is air conditioned and feature large private baths, mini-bar, telephone, color TV, cable service, and balcony or terrace with an ocean view. Not only will guests be able to enjoy a number of luxurious amenities inside the hotel, the property also has trails and lush gardens for visitors to explore the surrounding area as well. Tour services are available within the hotel with surfing, sport fishing, and sightseeing excursions being offered for your convenience. . After an exhausted day of traveling or participating in a variety of activities, guests can pamper themselves and their aching muscles with massage treatments offered by the hotel.